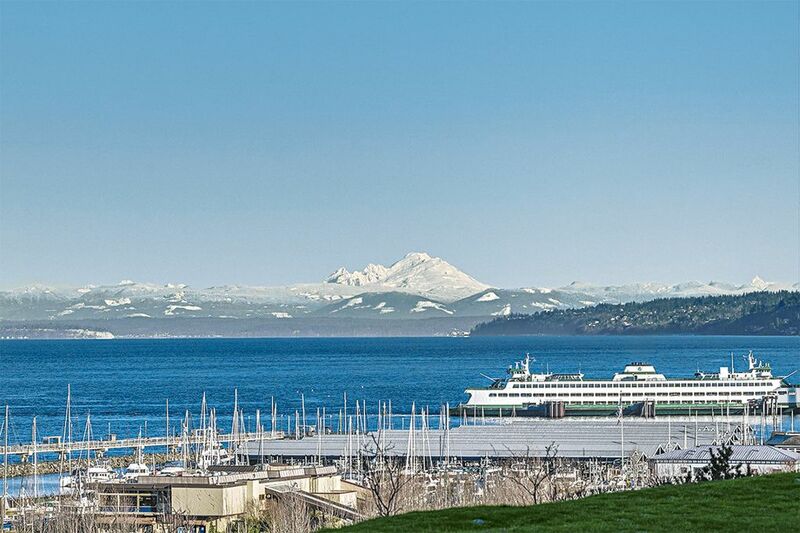 EDMONDS — Imagine your life in one of Washington’s most picturesque waterfront towns, but one that’s much more than just a pretty face. Picture a home within striking distance of Puget Sound’s major employment, technical and technological hubs in Seattle, Redmond and Bellevue. Now picture those homes starting from the mid-$300,000s. The life you imagine can now become reality at 50 Pine Street, a luxury condominium community of 68 architect-designed homes, offering spectacular views of Puget Sound, the Olympic Mountains and Mount Baker, as well as immediate access to the unparalleled comforts and charm of Edmonds. Edmonds is situated in Snohomish County midway between Seattle and Everett, making it ideal for city commuters who need quick access to work, but want to come home to a quaint beach community. Not in the mood to drive into Seattle? Hop on the Sounder train for a stress-free ride into the city. 50 Pine Street is a luxury condominium community of 68 homes located in the picturesque town of Edmonds. 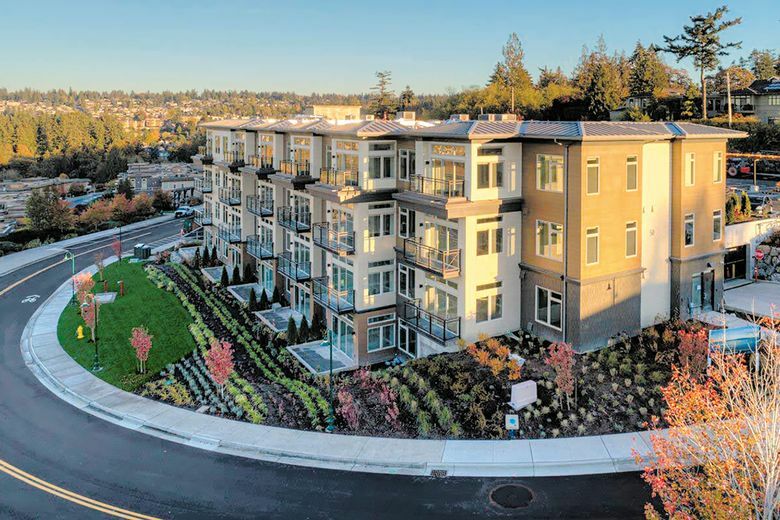 The small-town vibe of Edmonds, located on the shores of Puget Sound 20 miles north of Seattle, is just one of the many reasons 50 Pine Street is such a sought-after address. And, with housing prices in Seattle prohibitive to many first-time buyers, Edmonds is an affordable alternative. “Living in downtown Seattle or Bellevue is a dream for a specialized few, but the hustle and bustle isn’t for everyone, and often these homes are out of reach for today’s families,” says Tanya Foster, community sales manager at 50 Pine Street. “By moving just 20 minutes further north, it opens up a whole different world. The one- and two-bedroom units at 50 Pine Street, some with patios and waterfront views, are priced from the $330,000s to just above $1 million. With fewer than half the homes remaining for sale, the time is now to claim your future residence affordably, and comfortably, so close to the heartbeat of Puget Sound, Foster says. With 11 different models to visit, from the efficient Sierra plan (582 to 594 square feet) to the spacious Sprague and Seaview models (1,324 to 1,338 square feet), there is a condo to suit any lifestyle at 50 Pine Street. All homes at 50 Pine Street are built to endure, using long-lasting, low-maintenance design and materials. Finished with designer-specified materials, colors, fixtures and cabinetry, each home is planned to take maximum advantage of the natural light and available views. Every unit offers an inviting master bedroom with walk-in closet, chef’s kitchen with slab quartz countertop and undermount sink, hardwood flooring in the kitchen and living areas, wall-to-wall carpet in the bedrooms, and a laundry room with front-loading Whirlpool washer and dryer. The kitchens feature European-style cabinetry and stainless-steel KitchenAid appliance packages with gas ranges. Building amenities include a fifth-floor resident lounge, a spacious patio with fire pit and an exercise facility. There is also a rooftop deck with barbecue and views of Puget Sound and the Olympics. 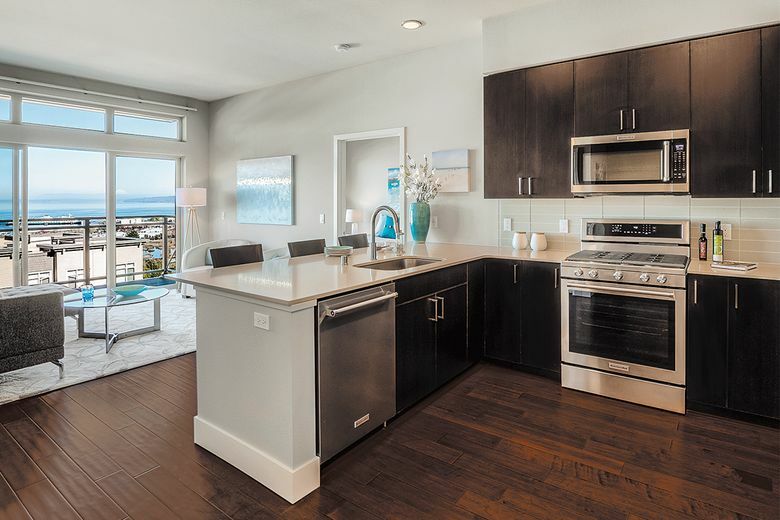 Homeowners can enjoy views of Puget Sound, Mount Baker and local ferry crossings. Parking is available for each unit, with 118 stalls at both street level and below-grade, with extra storage available for select units. Parking for electric cars is available, as well as gated, assigned parking for residents. 50 Pine Street enjoys a prime perch among the vibrant streets of downtown Edmonds, which pulse with charm and character in any season. Homeowners are moments away from nearly 50 cafés and dining destinations, 11 health and medical centers, dozens of parks and recreation destinations, and an abundance of shops and boutiques. Making life in Edmonds even more convenient are the close proximity of Alderwood Mall, Costco and Snohomish County Airport (Paine Field), where commercial flights on Alaska Air and United are offered.